last night we had another book(food) club gathering (#almostatherapysession). it was a good-good night. we had home made hummus with tahini and lots of citrus topped with chopped heirloom tomatoes served with fresh cut vegetables, a simple arugula salad, minty taboulé (latest obsession), olives, grilled tomatoes, goat cheese stuffed little red peppers, (ohsogood) feta cheese with honey and walnuts, poirs au sirop (fancy way of saying pears in syrup-recipe to follow soon), and ice cream. there was a big basket of fresh breads (yes, we were bad). come to think of it, there aren’t many things more satisfying than sitting around (a round) table with good friends, enjoying freshly made simple food and (just a few) drinks (or more) while sharing stories and exchanging ideas. It is truly therapeutic and necessary for the soul. all of it: the company of true friends. laughter. (good)food. lots of it. new ideas. old stories. new ones too. more laughter. encouragement. support. a warm slice of bread dipped into a deliciously balanced homemade hummus. a sip or two of rosé. every few minutes. warm chatter. dirty dishes. leftovers. hugs and kisses. another good night come and gone. good memories remain. and leftovers. i really like pears, they are possibly my favorite winter fruit-but when they are sitting all pretty and wholesome in the fruit bowl i very often forget to eat them (not as easy as an apple to bite into, i guess) until they become too mushy and ripe. 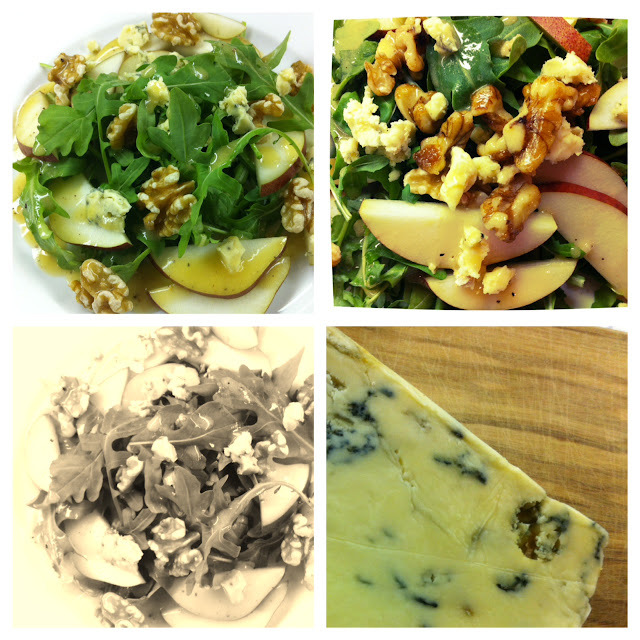 this time i decided to combine the beautiful sweet anjou pears in my fruit bowl with some stilton cheese (they had samples at the market, i tried a piece….flavor explosion-there was no option but to bring some home) to make our dinner salad. it was a big success in a sweet and sour, crunchy, deeeee-licious, and very satisfying sort of a way. this salad is a meal in itself along with a nice bowl of soup or a slice of toasted whole grain bread. one more thing-i’m pretty convinced my lemon shallot vinaigrette drizzled on almost anything yields the same delicious results. it’s that good. whisk it all together until thickened, allow the dressing to sit for at least 1/2 an hour before using.